Discussion in 'Downhill & Freeride' started by fat_sac, Nov 15, 2005. Anyone can suggest a cool looking and well designed chain tensioner for a 9 speed with horizantal dropouts? I only have one and it's tearing up my dropouts, and when I pogo real hard the other side shifts forward. The DMR is the only one I can think of. I haven't used it. spot brand makes some cool tentioners. why not just run the wheel all the way forward in the dropouts? Never thought about that. I guess I just wanted to look cool. 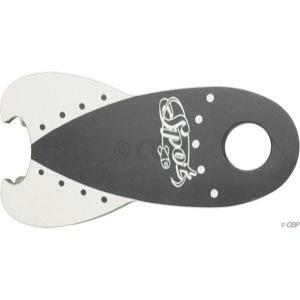 The surly tuggnut is the same deal, maybe a little more adjustable. Still, its got the bottle opener that could be used on either dropout. I don't understand, if you are running a cassette in the back then you should have a derailleur in the rear so whats all this chain tentioner talk? The derailleur is your tenstioner. Sounds like what you really need is a chain guide. There are two types of chain tensioners. One for vertical dropouts used when people convert to SS -- that is what you thinking about -- and the other type is for horzontal drops,especially bmx bikes, where you are running a bolt on axle and are used to keep the axle from slipping forward in the drops. bah I cant believe no one mentioned the Rennen Rollenlager? !